Super Savings Item! Free Shipping Included! Save 32% on the EASYGUARD EC003 Smart Key PKE Passive Keyless Entry Car Alarm System engine start button Remote Engine Start Universal Version by EASYGUARD at Nebula Fia. MPN: ec003. Hurry! Limited time offer. Offer valid only while supplies last. Dear customer, This is 1pc EASYGUARD brand EC003 PKE car alarm system with PKE-Passive keyless entry, remote engine start & keyless go function. 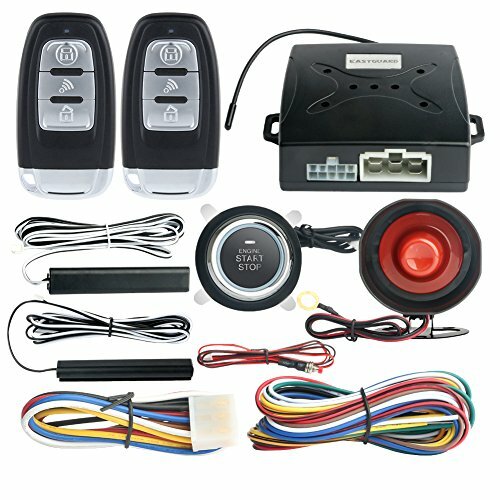 This is 1pc EASYGUARD brand EC003 PKE car alarm system with PKE-Passive keyless entry, remote engine start & keyless go function. Compatibility: The item can work with 95% DC12V petrol cars on the market. Not work with cars with double pulse locking or unlocking signals cars. Not work with vehicles with push start button & smart key already. Extra timer delay switch may required for diesel vehicle with engine starting/cranking time more than 3 seconds. Extra relay( such as SPDT relay ASIN: B078C7HF29) and/or resistors may required for some vehicles. With English user manual & installation guide included. This item required to be installed by a professional car alarm installer, Please check if you can find one or not before purchasing! Wiring diagram is available for reviewing upon request. You need to unlock/release/remove the steering lock if there is one in your vehicle while installation this item. An extra bypass module (Can work with most universal bypass module like ASIN: B00MEHBVIC but not compatible with CAN-BUS or DATA style bypass module) is required if there is a chip immobilizer in your factory OEM key fob. The item equip with 2 key fobs, each time only one key fob works while the other one goes to sleep mode till you activate it. Compatible with most DC12V cars on the market, include automatic transmission or manual transmission cars, professional car alarm installer installation is required. Extra bypass is required for vehicles with chip immobilizer in factory OEM key fob, can work with most universal bypass module, but not compatible with CAN BUS or DATA bypass module. If you have any questions about this product by EASYGUARD, contact us by completing and submitting the form below. If you are looking for a specif part number, please include it with your message.